Summer is just around the corner and your shirt sleeves are baggier than you’d prefer. The first reaction is to hop into curling every single day and commanding your arms to grow! But this is all a waste if your triceps aren’t the main focus in making your overall arm size greater. With the triceps making up about 2/3 of your total upper arm, hitting them hard and efficiently will be beneficial to get yourself a set of big arms – they might not grow into the size of melons overnight, but you can definitely build a solid base of muscle to continuously grow over time… Start now! The triceps is made up of 3 muscle heads within the back of the upper arm. The long head of the triceps makes up the largest part of the muscle and is found running down the back of the arm right up next to the torso. The lateral head of the triceps sits on the outer most portion of the upper arm and is responsible for the “horse shoe” that most bodybuilders strive for. The medial head sits in between the long head and lateral head. The primary function of the triceps muscle is the extension of the elbow as well as assisting with pressing movements. By changing the angle of your arm, you will be able to hit every head of the muscle with great intensity and precision. The first part of the triceps head we want to hit is the long head. The long head can only be fully stretched and fully contracted from an overhead position. Just remember, the greater the stretch, the greater the opportunity for better contraction. 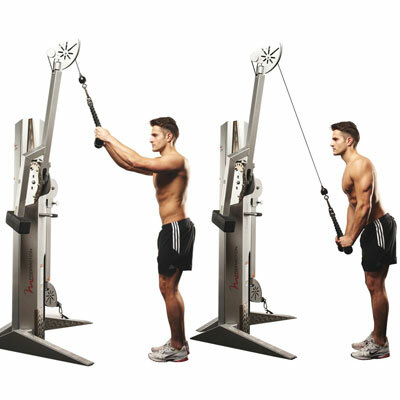 a) Start this lift by placing EZ-bar with both hands directly overhead – either standing, lying flat or incline. b) Then, bend at the elbows behind the head maintaining constant tension until cannot be further stretched. c) Press the weight directly back overhead but do not lock out elbows at the top of the move. d) Flex your triceps for a one count at top, and then repeat. Moving on to a compound movement that will hit all of the heads of the triceps, but focusing mainly on the lateral head. b) With your elbows close to your body, slowly begin to breathe in and lower yourself down to form a 90 degree angle between forearm and upper arm – by doing this, you will keep constant tension on triceps alone instead of letting the chest come in to play. d) As you reach the top, squeeze the triceps for a good 1-2 count focusing on the contraction at the peak of the movement. TOP TIP: Keeping your elbows tight against your core throughout the entirety of the movement will help engage the triceps and avoid shoulder damage. 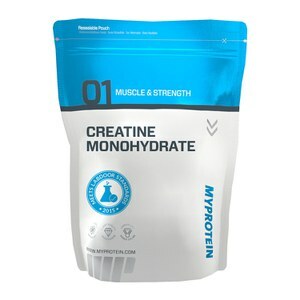 One key supplement I find very useful in overall strength and size of bringing up lagging body parts is Creatine Monohydrate. By taking 5g pre workout and post workout, this will help with strength, power and endurance when pushing it hard in the gym! The medial-head is worked in all triceps movements, but this particular can be accentuated by reversing your grip on any of the triceps movements. With all parts of the triceps muscles already being pre-fatigued from isolation and compound movements, we are able to hop in to another compound movement for maximum muscle worked. b) Narrow your grip so that your hands are closer than shoulder width apart – the knuckling on the bar is a great guide. d) Exhale whilst slowly pushing the bar up and squeeze for 1-2 seconds at the top. TOP TIP: When lowering the weight, don’t actually let the bar touch your chest- stop about 2-3 inches above it keeping constant tension on the triceps and off of the shoulder/chest capsule. Triceps pushdowns are great for targeting the lateral and medial heads of the triceps, specifically using a cable pulley! They are considered a key exercise in giving the muscle that desired ‘horse shoe’ look. A rope attachment helps to increasingly isolate the muscle for it to receive a much better contraction in comparison to using a straight or v-bar attachment. Note: Pick a moderate weight for this exercise – you needn’t go too heavy! Prepare by clipping a rope attachment to the high pulley on a cable machine. a) Standing upright, bend the top of your torso slightly forward and hold. Grab either side of the rope handles with a normal grip, so that your palms are facing each other – be prepared to exhale during the following movement. At full extension of the arms, by turning the wrist away from the body and pulling the ropes apart you can get a great contraction in the triceps! With a triceps routine laid out for you, all you have to do is put it to use! Get in the gym, get to work and get those triceps and biceps growing!